Boston’s most memorable piece of public art in years — the mural by Brazilian street artists Os Gemeos at Dewey Square — is no more. In its place is an abstract mural in gray and white by the London-born, New York-based artist Matthew Ritchie. The new mural is at once delicate and expansive, like a giant shadow cast by a dandelion. Its fragility helps to lighten the oppressive weight and impermeability of the office towers all around. 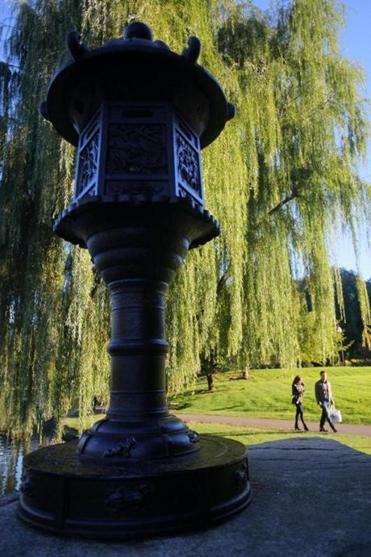 Boston has an abundance of public art, but just how good is it? And is it the art we deserve? 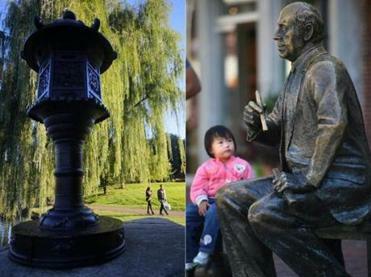 Among Boston’s better known pieces of public art are a Japanese lantern in bronze in the Public Garden (left) and Red Auerbach at Faneuil Hall Marketplace. The answer is that public art in Boston is great if your idea of public art doesn’t extend beyond memorials. This city has memorials by the bucket-load. And they are very often brilliant. They tell the story of this city, often from wonderfully oblique angles, in ways that activate the imagination and bring history to life. They’re one of the things visitors to this city come here to see. If, however, you expect public art to be more about art than about history, Boston’s offerings are frankly mediocre. I’m an art critic. That’s the kind of judgment I am probably expected to make. A high school history teacher might think differently — and fair enough. So let’s all take off our professional hats and try to apply a different set of criteria. What if, in judging public art, the litmus test were as follows: Does a given piece of public art help make the site a good place for two young people to choose as a rendezvous on a first date? Is it a work, first and foremost, that doesn’t remind them of their parents? Might it be expected, as did the Os Gemeos mural, to prompt a juicy conversation, inspire a witty line, or even something charmingly heartfelt? Might it prompt a fresh thought, or brighten up the city’s workaday atmosphere of commerce, obligation, and propriety, carving out instead a little pocket of provocation or hovering Eros? Modify the terms as you like. The couple could be older; the occasion less electric. But if the anonymous wielders of committee-backed power who commission public art in Boston were to ask this or some similar question — a question that has to do with real life as it is lived by this city’s inhabitants — instead of deferring to the usual soporific checklists of appropriateness and suitability, we might actually end up with something better than we have. I spent several days scouring the area — in particular the area between the Rose Fitzgerald Kennedy Greenway and the Commonwealth Avenue Mall, but also Cambridge, Fenway, and further afield — and I came to this conclusion: Public art in this city is not just relentlessly conservative. It’s also dismayingly morbid. It’s all about memorializing dead men and traumatic events, and almost always in bronze. The men (there are only a sprinkling of women) might be mayors, sportsmen, soldiers, or statesmen. The fact that they’re almost all dead is not so much morbid as inevitable. But the great events? They really are a downer: deadly fires, famines, gun murders, genocides. The worst of them may be the New England Holocaust Memorial in Carmen Park on Congress Street, a series of connected glass towers that invites you to walk through small jets of steam, representing smoke but inevitably evoking the gas chambers. The Holocaust and taste obviously have nothing to do with one another, but memorials and taste do, and this one seems to me to fail on that front. The Holocaust is beyond such pretending, beyond theater. 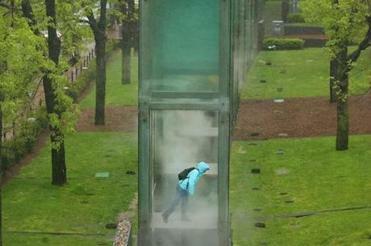 The New England Holocaust Memorial in Carmen Park on Congress Street in Boston involves a series of connected glass towers that invites visitors to walk through small jets of steam. This memorial is followed closely by what is, according to my own informal poll, the most mocked and reviled public sculpture in Boston: Robert Shure’s 1998 Boston Irish Famine Memorial on the plaza where Washington Street meets School Street. It shows two groups of Irish families, one emaciated and despairing, the other, having found prosperity in the new world, hale and hearty. To some whose history this is, it may have resonance. But as art? It’s pure kitsch. Of course, there are many other sculptures commemorating tragic, martial, or disturbing events that are more successful. Boston’s piece de resistance of public art — Augustus Saint-Gauden’s majestic “Robert Gould Shaw and the Massachusetts Fifty-Fourth Regiment” — is a Civil War monument, and one of the greatest examples of public art in the United States. Nor would anyone deny that Robert Kraus’s Boston Massacre/Crispus Attucks Monument, erected on Boston Common in 1888, or Ted Clausen and Peter White’s 1997 Vendome Firemen Monument on the Commonwealth Avenue Mall, deserve their place in the city. But why such a preponderance of bronze? And why so much morbidity? Over the course of the 20th century, from Rodin on, sculpture enjoyed an unprecedented period of transformation. Its technical possibilities blossomed, and so did its expressive potential. Materials other than bronze and stone came to the fore. Works could now be assembled rather than carved or cast. They could sprawl, spill, soar, or lie supine: They no longer needed plinths. Public artists began to flirt with everyday and even ephemeral values. They tried to rival the scale of architecture. And perhaps above all, they embraced color. Dismayingly, very few of these innovations have taken hold in Boston. Yes, some of Boston’s public artists have embraced abstraction, now that it is no longer remotely controversial. But by and large, public sculpture here still means bronze figurative sculptures on plinths. It’s no wonder that other efforts to brighten up the urban environment have come to the fore, some of them controversial. Street art, for instance. There’s little doubt that the increasing visibility of graffiti — much of it ugly and infantile, but some of it lively, beautiful, even inspired — reflects youthful frustration with an urban environment that expresses only the taste of the silver-haired set. Lilli Ann Killen Rosenberg’s “City Carpet/Hopscotch” mosaic commemorates the establishment of Boston Latin School on the sidewalk at School Street. Graffiti artists are not about to go away. The right policy would be to harness their creativity, and to steer their efforts away from vandalism and toward (legal) expressions of beauty, agitation, and ambition — the bolder and brighter the better. The biggest problem facing public art in Boston is, quite simply, the lack of vision. That lack of vision is the direct result of a process that relies too heavily on bureaucratic decision-making and is stymied by too many vested interests, too much red tape, and (how else to say it?) not enough good aesthetic judgment. The best recent efforts, as a result, have focused less on permanence and more on a temporary, guerrilla-style approach. Increasingly, we are seeing installations that stir up debate, winning supporters and detractors both, and then disappear, to be replaced by something else. This is the model established by the Institute of Contemporary Art at Dewey Square. Largely because it makes it easier for ambitious proposals to come to fruition, the new tack has much to commend it. It has a history, too. Before director Jill Medvedow accepted her post at the ICA, she was in charge of Vita Brevis, an organization she founded in 1997 that was dedicated to producing public artworks in unusual places. The name itself — “Vita Brevis” (life is short) — suggested a frustration with the slow pace of change in Boston’s public art. Inspired by similar organizations in London (Artangel) and New York (Creative Time), Vita Brevis aimed to follow the lead of artists, rather than bureaucrats, in connecting audiences with artists outside the museum setting. Some of its projects were ambitious. 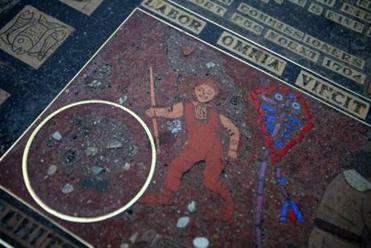 Krzysztof Wodiczko, for instance, projected the faces, hands, and voices of five Charlestown residents devastated by unsolved murders onto the Bunker Hill Monument over three nights. Morbid, sure. But ambitious, unexpected, democratic, and heartbreakingly poignant. The Dewey Square projects by Os Gemeos and now Matthew Ritchie (both pieces were commissioned by the ICA, and both overlap with solo shows by those artists there) are, in a sense, a continuation of Vita Brevis, which was subsumed into the ICA when Medvedow took over there. Other attempts to steer public art away from bronze, figurative memorials on elevated plinths have been made. But too often they feel half-hearted and smack of tokenism. “Cool Globes: Hot Ideas for a Cooler Planet,” for instance — the current installation of giant painted and otherwise decorated globes on Tremont Street at Boston Common, Copley Square, the Esplanade, and Logan Airport — is fun and colorful (it has colonized other US cities before Boston). But like most communal efforts at friendly political art, it’s aesthetically lackluster. The globes bring color to the city. But they look shabby. At the other end of the spectrum, a number of new, and for the most part abstract sculptures and murals have been sprouting in plazas and on sidewalks across the city. “Uplift,” a wavy aluminum sculpture by Mia Pearlman, was recently installed outside the Liberty Mutual building in the Back Bay. And “Convergence,” a show of sculptures in a variety of styles by the Boston Sculptors cooperative, has been showing over the summer and fall at the Christian Science Plaza (through Oct. 31). Such efforts are to be commended. But none manages to blend prominent positioning with high quality. If they are good, they tend to be slightly tucked away (here, too, you might also name Ellsworth Kelly’s wonderful colored panels in the John Joseph Moakley United States Courthouse and Sol LeWitt’s “Wall Drawing #1128” at 100 Cambridge St. near Government Center). And if they are highly visible, they are either unadventurous or weak. There are some exceptions: Lilli Ann Killen Rosenberg’s “City Carpet/Hopscotch” mosaic, commemorating the establishment of Boston Latin School on the sidewalk at School Street, is an unassuming treasure. The Arthur Fiedler memorial on the Esplanade by Ralph Helmick is an arresting take on a Boston legend. And Michio Ihara’s “Wind Wind Wind,” a modernist work in steel with kinetic elements, which was moved from Wellesley to a plaza on State Street near City Hall last year, is at once beautiful, sensitive, and inventive. But the reality is that, for a truly rewarding, high-quality tour of contemporary public art, you really need to go to a college campus. The best — and closest to the heart of the city — is Massachusetts Institute of Technology, which has a superb collection, built up over many years, of works by the likes of Alexander Calder, Anish Kapoor, Mark di Suvero, Louise Nevelson, Frank Stella, Lawrence Weiner, Sol LeWitt, Sarah Sze, and Ritchie. Other colleges, including the University of Massachusetts Boston, have solid offerings by noteworthy contemporary artists, too. How to explain the conservatism in Boston’s public art? Why the relentless lack of adventure? Is it just Boston being Boston? Or are there events in the past that help explain the situation? It’s no doubt a combination of both. But one event that occurred in 1966 may still be sending out ripples. When the modernist architect Walter Gropius designed the John F. Kennedy Federal Building at Government Center, the Abstract Expressionist painter Robert Motherwell was commissioned to paint a large mural to cover a section of wall on the building’s ground floor. In the uproar that followed, Motherwell was described as a “disgrace to America.” Modern art in general was pilloried. Motherwell’s somewhat pompous protestations of innocence (“I don’t know how people who know nothing about art feel competent to be art critics”) only entrenched the old battle lines between intellectual elitists and the so-called common man. A traumatic political event (in the ’60s, a presidential assassination; in this case, 9/11) had once again triggered a paranoid and erroneous reading of a work of public art. In the earlier case, a return to timidity and innocuousness ensued. Has it done so again? The new Dewey Square mural by Ritchie may not stir up politicized debate, but it does not necessarily signal a retreat. The discussion around public art in this city should not be cast as a battle between art that stirs up political controversy and art that is boringly sedate. There are all kinds of ambition when it comes to public art. It doesn’t much matter what form that ambition comes in: We just need more of it.